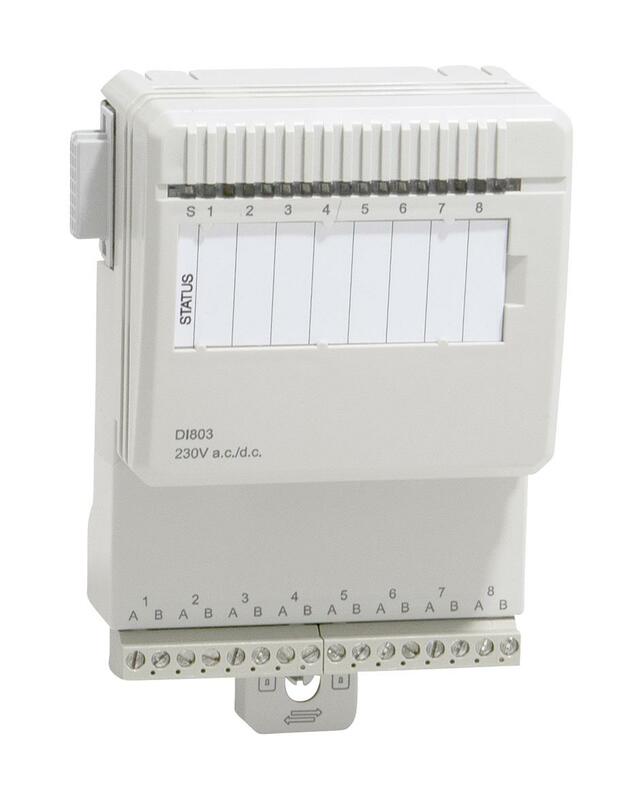 The DI803 is an 8 channel 230 V a.c./d.c.digital input module for the S800 I/O. This module has 8 digital inputs. The a.c. input voltage range is 164 - 264 volt and the input current is 7.6 mA at 230 V a.c. The d.c. input range is 175 - 275 V and the input current is 1.6 mA at 220 V. The inputs are individually isolated. Every input channel consists of current limiting components, EMC protection components, input state indication LED and optical isolation barrier. Signal specification 230 V a.c., 220 V d.c. Input voltage range, "0" 0..50 V a.c., 0..40 V d.c. Input voltage range, "1" 164..264 V a.c., 175..275 V d.c. Maximum field cable length 200 meters (219 yards) 100 pF/m for a.c., 600 meters for d.c.